Just a 14 minute drive from the brink of Niagara Falls! Our 'hoblet' has the look of a woodsy cabin, but is spacious and modern. 600 sq. feet in total with a large studio living room, separate bedroom and a bathroom with a built in 2 seater far infrared sauna. Outside is viewed through 5 sets of double glass patio doors & 3 skylights.The "hoblet" is self catering with dishes, linens, towels and basic kitchen staples, e.g. tea, coffee, spices etc.. The green living roof is very special. Your 'yard' is a hardwood forest with a small stream running through. Beautifully landscaped out in the country yet only 15 minutes from the brink of the falls with emphasis on nature and good energy. On site and for your viewing is our equine rescue, home to 7 donkeys, 1 mule, 4 pot belly piggies, and 2 wonderful, friendly little goats, (3 dogs). 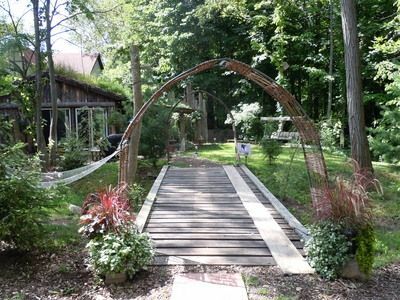 Your rental is completely private from the main house, has its own driveway with a delightful walk through the trees and past the 'circle of elements', a great fire pit with boulders encompassing that space. Wonderful walks by the forest, ponds, & stream all help to create a very special energy in and around the 'cabin'. Your host, Petra, has received the Ambassador of Tourism Award from the Canadian government during her eight years as a professional tour guide in Niagara Falls, now Petra spends her free time looking after the donkeys and animals, and her guests. Please see our website for more photos of the 'space' and the surrounding area, as well as more info and details. We look forward to meeting you! For our guests staying 3 nights or more, a 'Meet and Greet with the animals is included (upon request, weather permitting) with your stay. Spend some one on one time with your favorite donkey. The emphasis is on nature - enjoy the views and the animals. Please be advised that children must be a minimum of 14 years of age (for staying at the hoblet). PLEASE BE ADVISED OF OUR STRICT CANCELLATION POLICY. There is only the one "hoblet". We strongly recommend you purchase cancellation insurance so you are protected in the event you cannot travel. I have over 8 years experience as a professional tour guide in Niagara Falls. And a proud recipient of the Ambassador of Tourism Award from the Canadian government. We share our 'space' with 3 dogs, and 7 equines, 4 pot belly pigs named Sheldon and Shpeck, and 2 little, sweet goats; Monty and George. We are passionate about animal welfare, and preserving nature. Having lived and worked in seven countries and traveled extensively, I believe my husband and I have come to understand what our national and international guest appreciate and expect in their travels. We look forwarding to helping you see all the Niagara Peninsula has to offer, there is so much more than just the falls. (Plus our tricks of the trade can help you save money, time and aggravation). Avoid the hustle of hotels and the commercialism. Its all there for you when YOU want it, a short country drive away. Enjoy the energy of the forest and nature and at the same time your patronage helps provide the care and welfare of the rescued animals on site (as well as any other rescue situations that come our way). Be a part of it 'all' in so many different aspects than the everyday traveler experiences now a days. We are unique! For more photos, and a 'feel' for what we have created please ask about our website - truly a retreat, a center of Natures Energy, yet all the modern comforts and facilities, and so much more! Even the locals come for a visit. out in the country, but yet close enough to all the amenities, NOT an isolated area. Good for country walks or bike ride. Scenic countryside. Views of the forest from the cottage. upon request, the 5 patio doors and position in by the woods makes for a comfortable 'climate'. Only the bedroom can have an air condition put in (window unit). (please note there is a charge). the hoblet is fully furnished, fresh linens, beds made (unless you are using the air/bed mattress, there is a 'bed in a bag' for that), blankets, dish towels, towels etc. few staples such as salt, pepper, coffee, teas, sugar etc. outdoor fire pit, the 'circle of elements', wood provided (free) as well we can prepare your fire if you like. you are welcome to borrow our kayaks (free), beach and waterways are a 15 min. drive. nestled by the woods, use of 'circle of elements' 24 ft diameter fire pit, equine rescue, private modern 'studio', used for retreats (self catering) just 15 min. from the falls, 5 min from shopping, lightly stocked kitchen (essentials), wonderful and peaceful energy here, living roof, 3 skylights and five sets of patio doors. I had a most wonderful visit at the Hoblet. Petra and Mush were kind and generous hosts, eager to make my stay special (which it was). The property has a peaceful, positive energy which provided me the opportunity to relax and recharge. The cottage itself was charming and comfortable and provided a great selection of movies and reading materials to enjoy during the quiet times. The location was ideal. Convenient for traveling around and exploring the very many parks and attractions in the region. Of course, the critters were an absolute joy to be around! Unfortunately, this made it rather difficult to leave. I think the work and dedication Petra and Mush give to animals-in-need, to provide this loving sanctuary, is very special indeed. It's nice to know that I can help support their efforts while having a great holiday at the same time. I will be back. Thanks folks for all your kindness and hospitality. We found the Hoblet to be a relaxing retreat. We loved the animals and most of all we loved our hosts. Mush and Petra where friendly and helpful people, we got along as though they were family which made the stay joyful and also sad to have to leave. The animals were a joy, loved waking up to the pigs wondering through the front yard in the mornings they loved the fruit and vegetable snacks we gave them. The two goats would bleat a morning greeting when we got up to make our coffee, so of course I had to go out and give them their snack of fruit and veggies. The donkeys were a little shy at first but some cut up apples changed that. The Hoblet faces a forest so when you look out the patio doors (3 sets) you see nothing but trees and hear the birds. A truly restful stay. We will return. Thanks so much! It was an honour to have you here for such a special occasion, your 50th anniversary! You both were an inspiration. By the way, Gretel still goes up to the door looking for you and her treats, lol. We wish you both all the best and truly hope to see you again. As we rescue donkeys (and 'anyone' else in need, our latest arrival is Sheldon the pot belly pig) we find our guests enjoy the spirit of the animals. Included in a 2 (or more) night stay is a 'meet & greet' with the animals. One on one time and supervised by ourselves to introduce you to the animals that have found a home here. Groom them, hear their stories,and learn what is involved in taking in an animal. Many of our guests have commented on learning information about certain animals that has effected their decision on which animal would fit in their situation and which would not. Great photo time as well. This feature is totally optional. Some our guests barely have time to see all the sights in the area. When you check it just let us know if you would like to schedule a 'meet & greet'..